At first glance the winter landscape looks so desolate, monotonous and colorless. However, I find that once my eyes/mind get tuned into the trees, their trunks and bark, I see abundant subjects of interest. Here are photos of the great variety that caught my eye one day in early January in Edmonton. Looking back on 2018, I didn’t do as much abstract photography as I thought I did. At least I didn’t capture as many images during 2018. 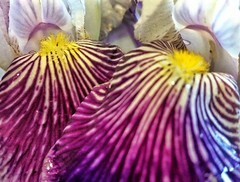 I did finish up a number of abstract photos that I had taken years ago, and they are among my favorite images. However those images are not included in this 2018 collection, so please look back to my earlier “abstract photography”- tagged blog posts to see them. As much as I love color there is something about black and white images that has always appealed to me. Inevitably when I go out a shoot a bunch of photos a number of them (maybe 10%) will scream out at me to be represented monochromatically. 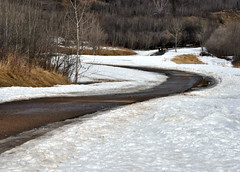 An exposed and therefore snow-free, south-facing bank of the North Saskatchewan River valley in Edmonton. Large chunks of ice at spring break-up on the North Saskatchewan River. River ice sheet breaking under pressure. Here is a collection of my favorite photos from each month in 2018. I didn’t start out looking to adhere to any particular theme but as it turns out, all of these are images of the natural environment and they were all taken close to my home, in Edmonton’s river valley. So there you go, my “favorite” photos taken in Edmonton during each month of 2018. For some months it was hard picking a favorite, so, especially towards the end, I would default to the image that was most consistent with the developing “nature” theme. I am tempted to assemble another collection focusing on my black and white, or abstract photos from 2018 – stay tuned. In the depths of a dull November day I reached back in my photos archives for some memories of spring to brighten my mood. Watch for more abstract photo images from this day in Spring Revisited (Part 2).